Bubble water walls are great ways to add elegance, relaxation and entertainment to a home or office space. They come in a variety of shapes, sizes, colors and materials, making them ideal for nearly every type of business office, restaurant or spa. Bubble walls also have multiple benefits over aquariums, wall paintings and artificial plants. ns. Floor standing, wall hanging and interior window water fountains are the three main types of bubble walls. Besides adding a focal point to a room, bubble walls can also be art pieces and room dividers. Bubble walls are very versatile and can be used in practically any type of business. Large, free-standing fountains can serve as room or wall dividers. Small, wall mounted bubble walls can take the place of generic, boring artwork. Bubble walls make for great additions in medical and dental office waiting rooms, restaurants, spas, bars and clubs. They can also be used in homes as a part of a man cave, entertainment room or in-home bar. Besides their versatility in being able to be used virtually anywhere, they also have other benefits that separate them from aquariums, and artificial plants. While bubble water walls contain water, they are easy and less expensive to maintain. They don’t spill water like traditional indoor fountains. These fountains can also be custom-made to reflect your company’s style and logo. The best part is that you and your customers or guests will be treated to a cool visual display. Bars & Nightclubs: Bars are known to be gathering places of friends and to engage with new people. Nightclubs are known for their pulsing energy. Both of these establishments are great places for exciting, yet hypnotic, LED light bubble walls that show off their greatest visual display in dark places. Besides the free standing or wall mounted bubble walls, these types of fountains can be utilized as the foundation of bar tops, adding to the desired feel of the space. 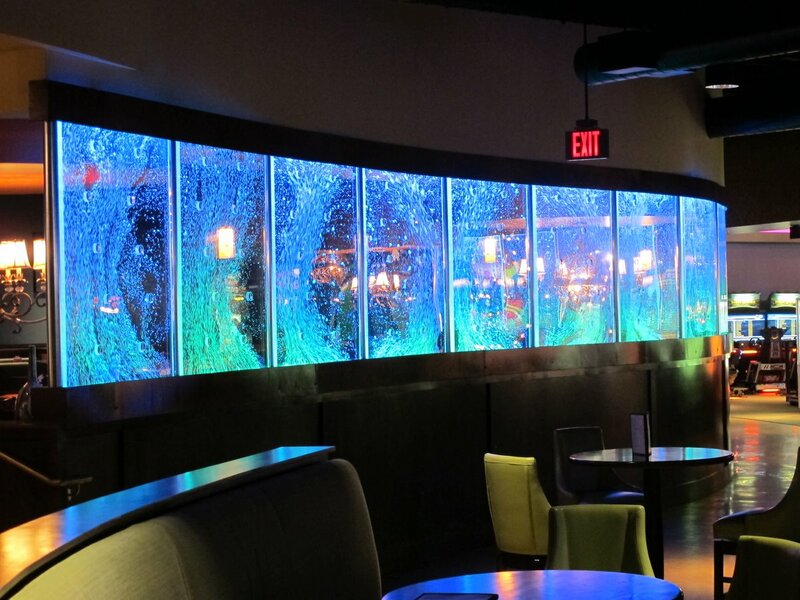 Restaurants: Bubble water wall features can take on whatever mood one wants, making them perfect for any kind of restaurant, whether it’s a casual family dining spot, a fun hip environment or an upscale or romantic fine dining establishment. The lighting and speed of the bubbles can be customized to match your desired mood. For instance, a yellow lit bubble fountain with fast bubbles may be a hit with young diners while a dark blue colored bubble water wall with slowly moving bubbles may enhance the relaxing, romantic feel of an upscale dining experience. Corporate Offices: Companies like to show off their opulence with luxurious-looking, hip and stylish architecture, interior design, decorations and décor. Just like bubble walls can be made to be elegant and evoke relaxation, they can be unique, modern pieces of art that will quickly catch someone’s eye and attention. Some business hubs like New York and the Silicone Valley in California emphasize modernity as many of their workforce are young millennials who like creativity. Bubble walls would be far greater additions to corporate offices that fit the above description because of their modern look and feel. Hotels: Hotels seek to create an environment that is relaxing, fun and elegant for their guests. Bubble walls can offer all three with their calming bubbles, exciting colors and clean, modern-looking frame and shape. Their versatility in color and size enables them to be installed on hotel lobbies of all sizes. Their lighting selection can match the look and feel of the rest of the lobby’s décor. Spas & Salons: While trickling of traditional indoor fountains provide a relaxing and aesthetically pleasing sound and look, bubbles walls are another great option. Though bubble walls don’t make a sound, their constant flow of bubbles are relaxing and mesmerizing to watch. Their relaxing effect can be accentuated by being lit with soothing colors such as blue, turquoise and purple. These colored bubble walls create a soothing atmosphere for guests as they wait for services or are having services done. Durability: Bubble water wall features are heavy and are made from thick acrylic panels and solid bases which make them nearly impossible to knock over. Acrylic bubble walls are durable to withstand everyday touching and bumping and are difficult to break and scratch, making them safe for children. With proper maintenance, bubble wall features can last many years. enjoyable both during the day and at night. Traditional business, office and restaurant décor can’t do that unless additional lighting is installed. With LED light bubble walls, the LED lighting is built-in, enhancing the bubble walls desired effect. 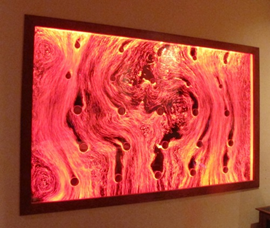 Additionally, the lighting of these LED bubble walls is conveniently operated with a touch of a remote button. Minimal Maintenance: Over time, dust accumulates on office and restaurant décor, most notably artificial plants, taking away the business’ professional and sanitary appeal. Traditional water fountains get algae in hard to reach places. Aquariums require constant cleaning and upkeep to keep algae at bay and fish alive. The maintenance of these objects can be messy and time consuming. With bubble walls, the maintenance is minimal and easy. Ideally, such fountains should be cleaned every two months with a deep cleaning every four months. Disassembly and reassembly of the fountain is quick and easy, and doesn’t involve one getting wet. Routine maintenance simply entails wiping down the acrylic panels. Cost. Bubble water walls vary greatly in cost from a few hundred dollars to thousands of dollars. Typically, the larger, free-standing fountains cost the most while the interior window fountains are the most affordable. Adding customized features such as tubing design and having multi-color lights add onto the costs. Generally, the bigger the bubble water wall feature, the more expensive it will be. There are a variety of fun, relaxing and elegant bubble walls of each size. Location. 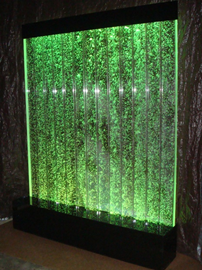 Where you want to put your bubble wall panel dictates not only the size, but also the style and lighting. You’d probably get a different bubble wall for a patient waiting room than for a wall-mounted bubble wall behind the bar in a nightclub, for example. Even within the same establishment, different rooms can have different vibes and décor that you’ll want the bubble wall panel to match. Size and Dimensions. You wouldn’t want to put a large floor-standing bubble fountain in a narrow hallway, nor would you want to hang a tiny wall-mounted bubble wall in a large room with a lot of unused floor space. The ideal size of the bubble fountain should be in proportion to the size of the space or room. Size is also determined by how dominating of the space you want the bubble wall to be. Style. When it comes to bubble walls, there are two styles: bubble baffle and baffle bubble. Bubble baffle fountains have built-in vertical tubes inside the panels where the bubbles flow upward. In baffle bubble fountains, the bubbles move freely inside the panels. The former give a more modern and fun experience while the latter offers more of a relaxing, romantic look. Quality. As bubble water wall features have become more popular, more companies have began making their own versions of these fountains. However, not all bubble walls are built the same. Some use low-quality materials which result in fountains with mechanical malfunctions, leakage and shorter lifespans. When looking around at bubble water walls, visit the showrooms of multiple dealers and ask questions about the quality of materials and acrylic used. Reach out online as well to make sure you are getting a quality bubble wall. As with most things, you’ll get what you pay for. Customization. With bubble walls, you have the ability to have a custom bubble wall to fit and enhance the look and feel of a space. Common customizations include colored lighting, styling, sizing and shape. 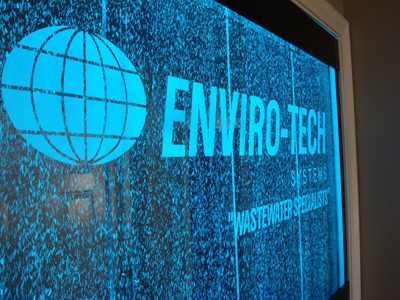 For a more professional look, custom bubble wall fountains can also be engraved with business logos. Bubble walls are quite an investment and may not be the best solution for everyone or every business. If you’re on the fence, Water Gallery rents out bubble walls . This is a great option for those who want to test one out to see if it’s a good fit for their office space. Water panel rentals are also ideal for special events where you want to add temporary pizzazz or elegance to the event space. Through renting one can experience the benefits of bubble water walls while at the same time save the hassle of set-up and return and expense should the fountain not be a good fit. Bubble wall water features are versatile, making them ideal for a variety of spaces and settings from corporate offices to medical waiting rooms to restaurants to spas to hotels. Bubble water walls have multiple benefits over traditional interior décor including being easy to maintain and various customization options. When choosing a bubble wall water feature it is important to consider the cost, size and style of the fountain relative to the desired space. Come and see for yourself why bubble water walls are becoming components of business décor by browsing the wide selection of acrylic bubble walls at Water Gallery. We are proud to be offering quality LED bubble walls, custom bubble walls, wall mounted bubble walls and free standing bubble walls for many years and use only the highest quality of materials. Contact us today to learn more about your bubble wall water features, to rent a bubble water wall or to make a purchase.